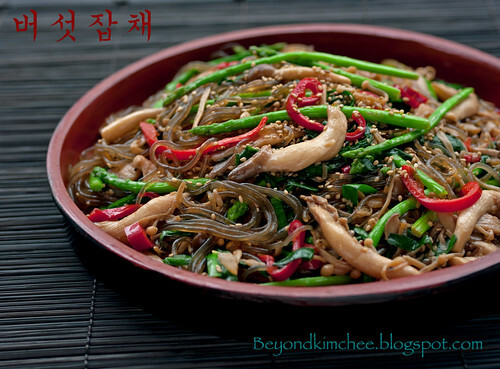 My very first recipe posting on this blog was Japchae, the famous Korean noodle dish. Sweet potato noodles with mixed vegetables and beef mingled in soy sauce. 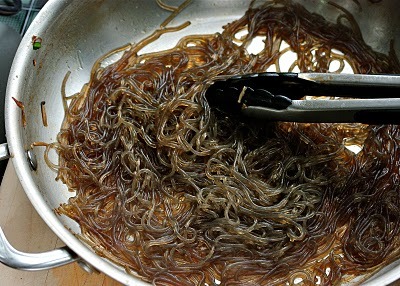 It is the traditional food of Korea. Today I would like to introduce the 21st century upgraded version of this Korean traditional dish. 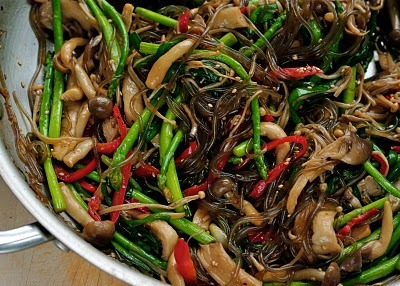 Japchae with assorted mushrooms, asparagus, red peppers, and Asian chives! 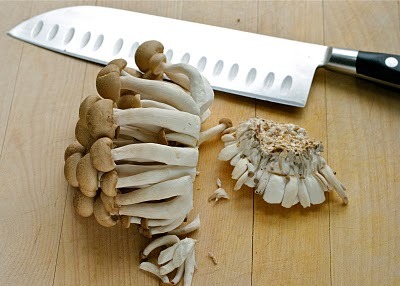 Do you know that mushrooms are so good for us? They say the ancient Egyptian believed that mushrooms bring immortality and only the pharaohs were allowed to eat them. 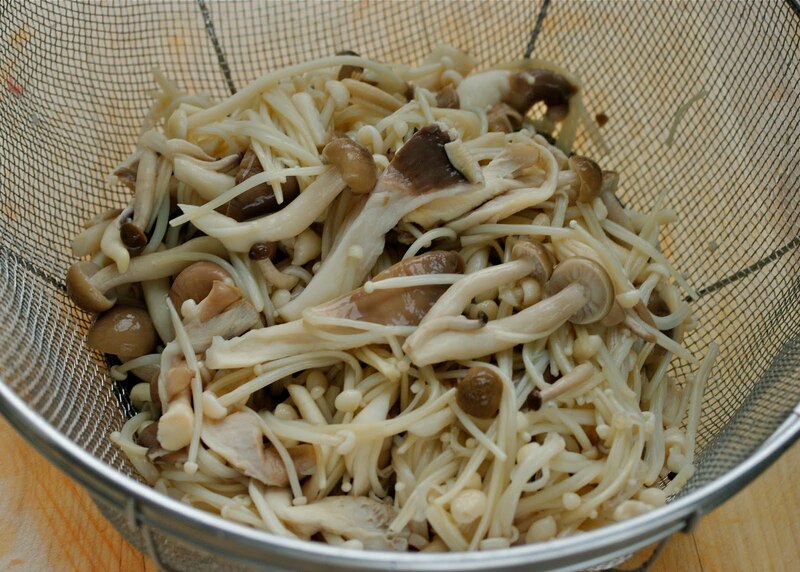 Chinese use mushrooms for not only as food but also as medicine as well. Normans in Middle age period in Europe used 1 pound of mushroom in the food to feed the groom at the wedding ceremony. Why? because mushrooms are known for its aphrodisiac power. Make sense! Asians have known for many years that mushrooms have medicinal powers with the ability to lower cholesterol and blood pressure, boost the immune system and inhibit tumor growth. 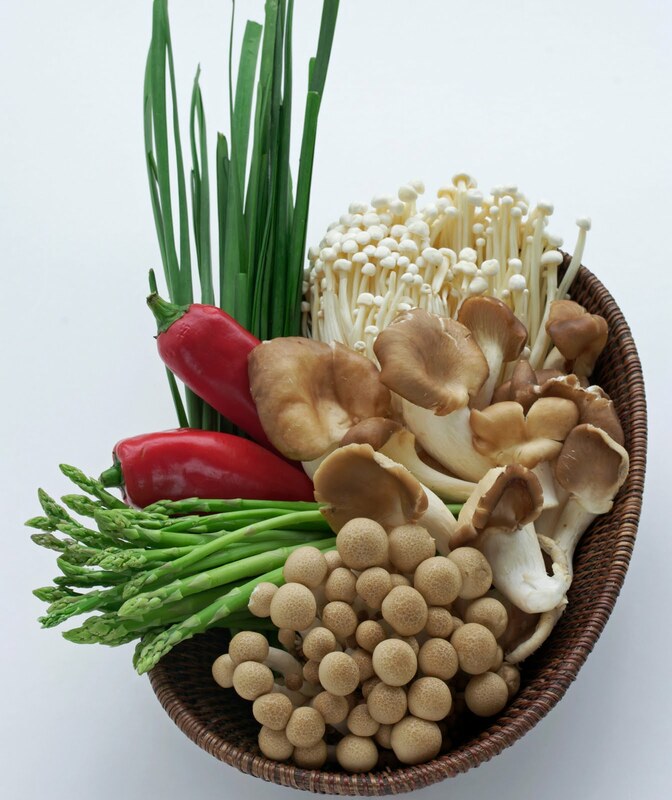 Lentinan derived from the shitake mushroom is used to treat cancer in Japan. Doctors in the U.S. are just now taking a look at these facts. 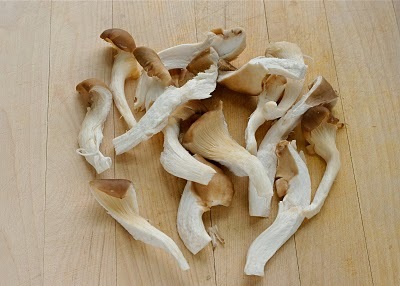 More information on mushrooms, click here. So eat mushrooms more often. Yes, They are “fungus” as my kids say. But I am not giving up feeding them these precious gift of nature. Someday they will enjoy…. Crossing my fingers! Here are the main casts of this dish. Enoki mushrooms(both white and brown), oyster mushrooms, asparagus, red chili, and Asian chives. 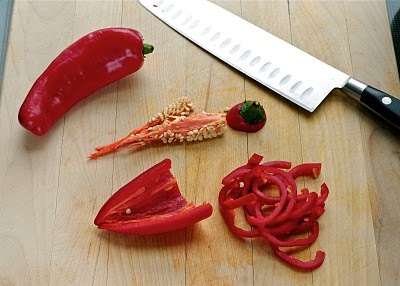 If you don’t want the spicy kick from the red chili substitute with bell pepper. Asian chives can also be substituted with onions. Asparagus is not a Korean vegetable. 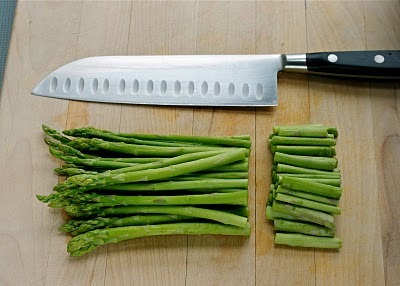 I have never seen or eaten asparagus before until I came to U.S many many years ago. I love them. I think these pencil thin asparagus compliments the mushrooms so well in the dish. You will like it. 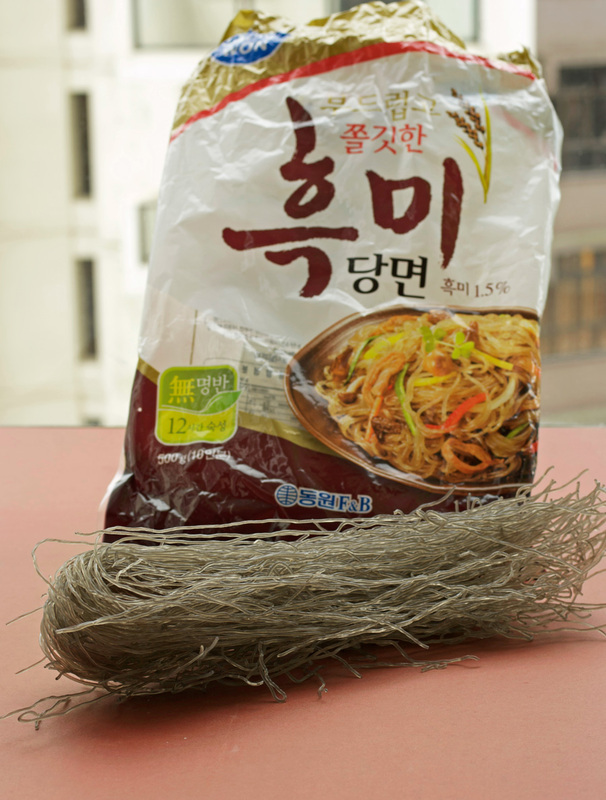 I used this sweet potato noodles(Dang-myun, 당면) that contains 1.5% black rice. They are darker noodles than regular ones, but not much difference in the flavor. Here are the supporting crews. Soy sauce, sugar, sesame oil and seeds, salt and pepper, and chicken broth. Garlic was sad because I forgot to add him on this group photo. Cut off the bottom of enoki mushrooms. Discard the bottom. You know mushrooms are quite clean creatures, so no need to be washed! Just brush off the dirt if you need. Tear off the oyster mushrooms. He is the meaty guy. 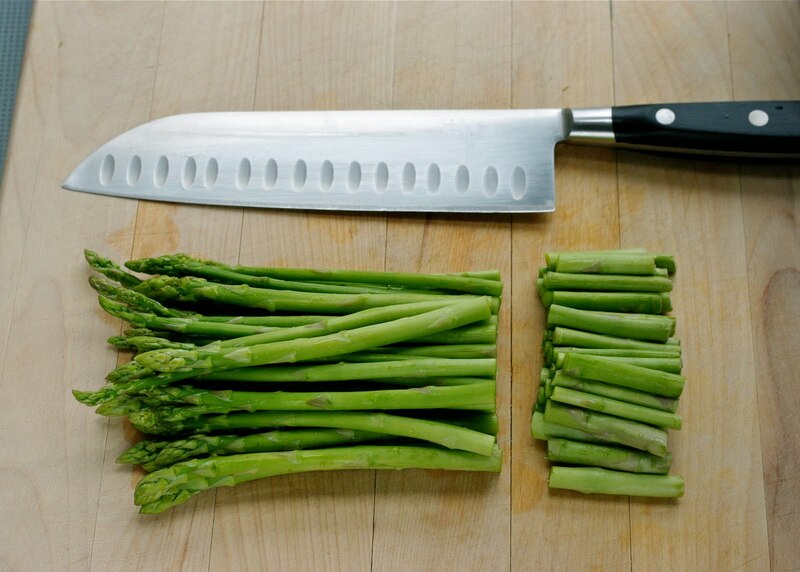 Cut off about 1″ of the wooded end of the asparagus. 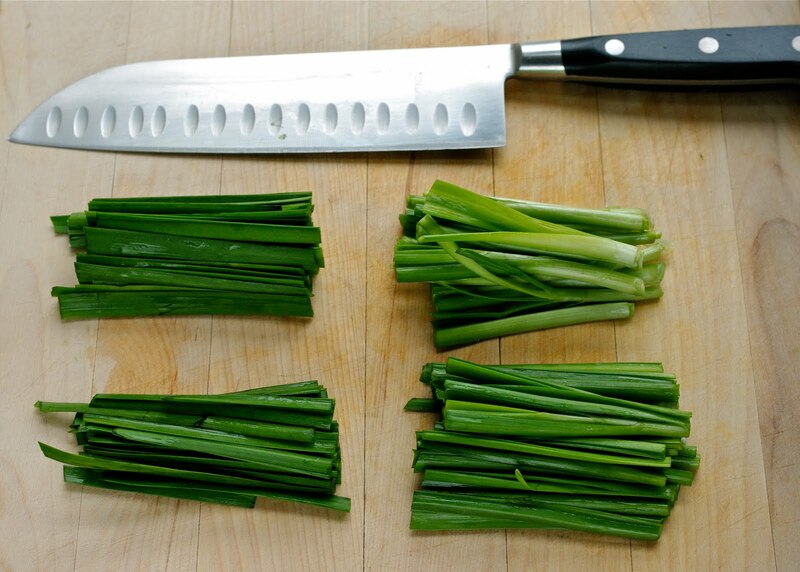 Cut the chives about 2 1/2″ long slices. Make sure to remove the seeds and the membranes. 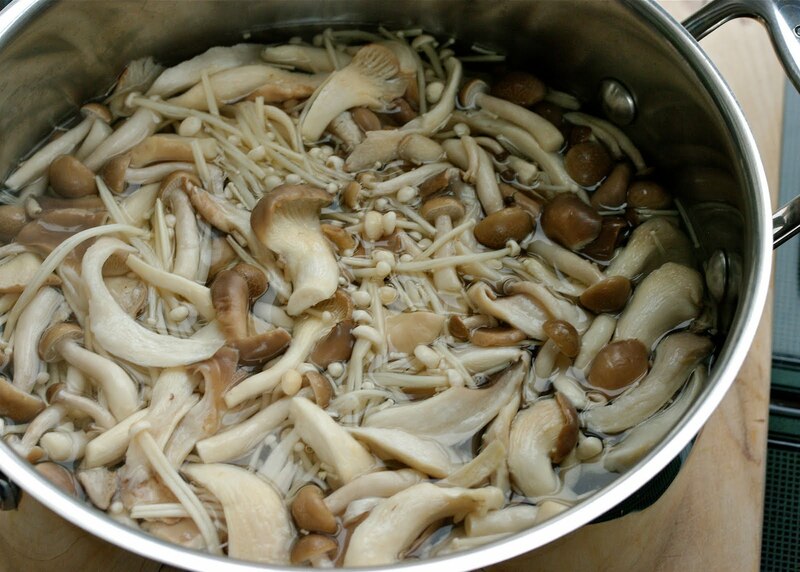 Blanch the mushrooms in boiling water for 5 seconds. This way you don’t need so much oil to cook them later. Press gently to squeeze out extra water. Drain well. 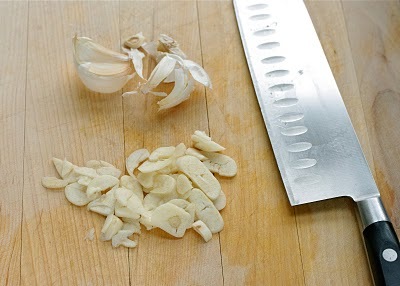 saute Mr. garlic and Mrs. pepper for 1 minute. 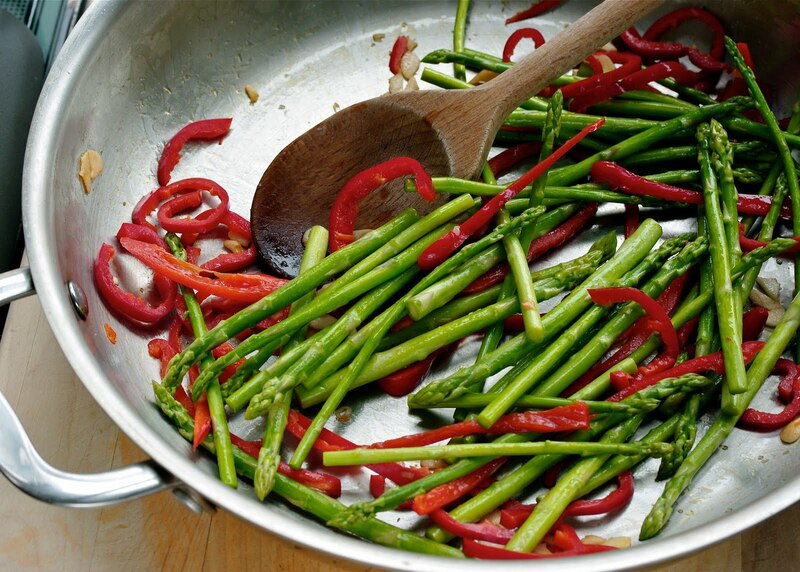 Add asparagus and continue to saute for 1-2 minutes. Season with salt and pepper to retain the bright red and green color. Add 2 Tbsp of chicken stock to the pan. Let it evaporated as you stir the veges. This will soften the asparagus and deglaze the pan. Transfer the veges to a plate. Set aside. In the same pan, add a little more oil and saute the mushroom. Add soy sauce, sugar, sesame oil, pepper ad some sesame seeds. Heat until the sauce gets incorporated with the mushrooms. Add the chives and cook until they get wilted. 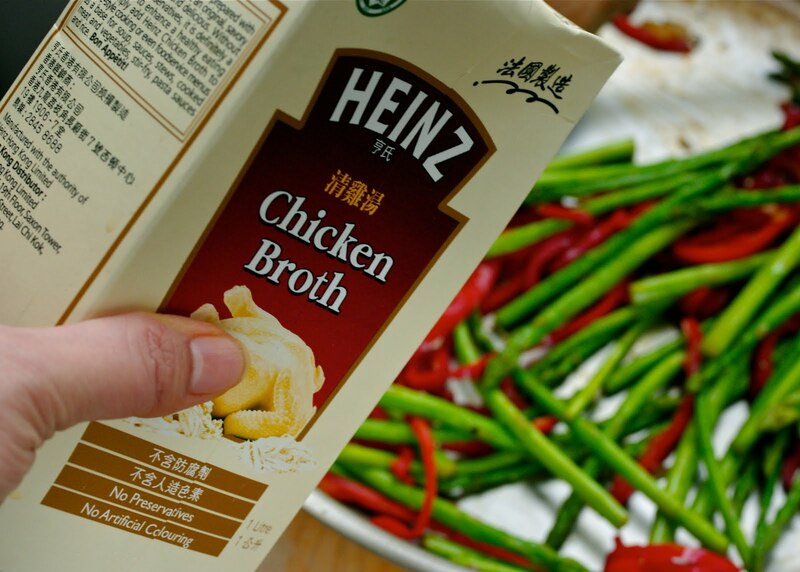 Now the noodle… Cook these guys by following the package direction. Drain and rinse under the cold water. Look here for detailed instructions. In the same pan over medium heat, add a little oil and saute the noodles for 30 seconds. Add soy sauce, sugar, sesame oil, and pepper. Continue to cook for 1 minute. Return the veges and mushrooms to the pan. Toss well. You might need to add more soy sauce or sugar. Finish with more sesame oil, sesame seeds, and lots of pepper. You can serve with some rice or eat as is. I am eating this as I am writing this post. Don’t you just love the unexpected free upgrades in life? Well, at least I can assure this Japchae is an upgrade! 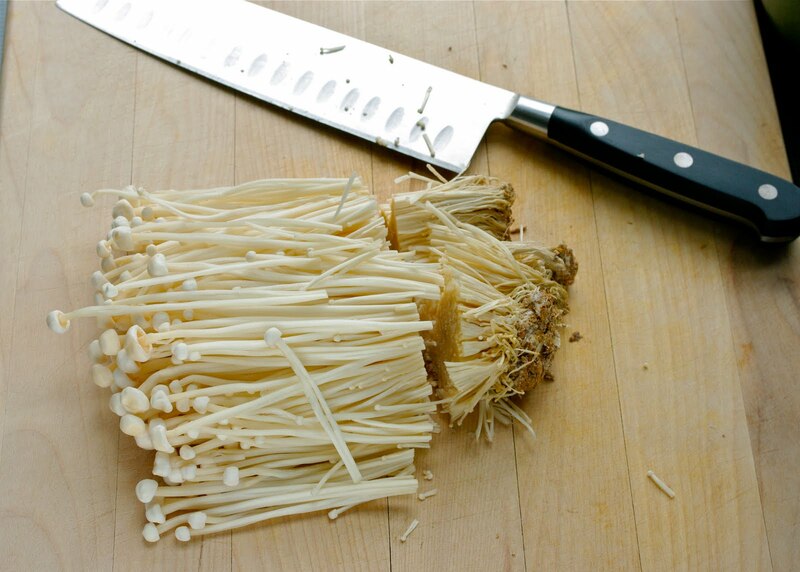 Cut off the ends of enoki mushrooms, tear or slice other mushrooms into strips. Blanch them in the boiling water for 5 seconds. Drain and rinse under the cold water. Remove excess water and set aside. Prepare the noodles following by the package direction. Set aside. Heat a large pan over medium-high heat. 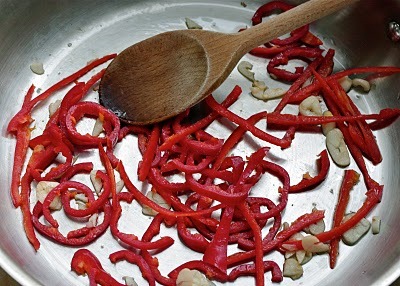 Add 1T oil and saute garlic and red chili(or bell pepper) for 1 minute. Add asparagus, sprinkle some salt to season and continue to saute for another minute. Pour chicken broth to the pan to soften the asparagus and also to deglaze the pan. 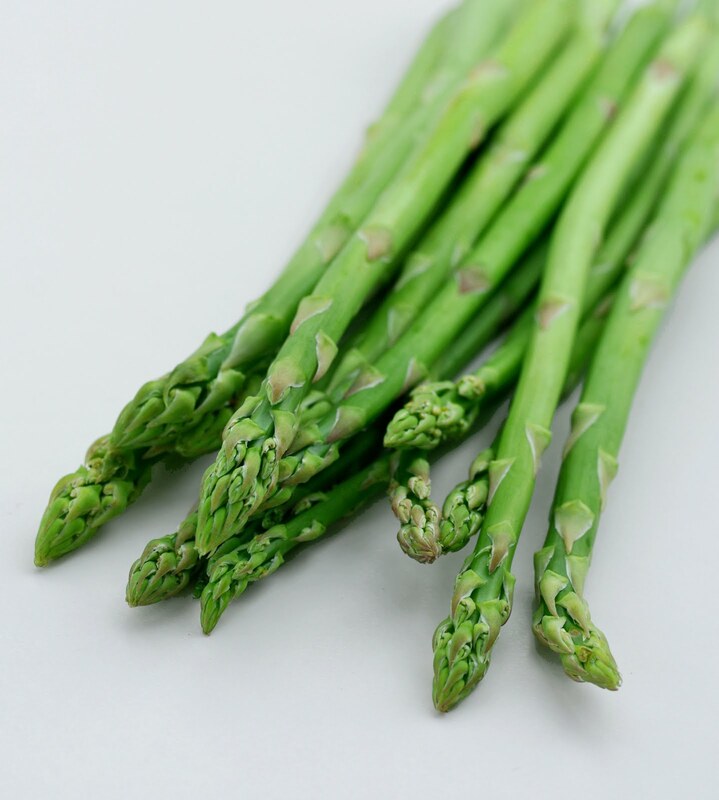 Make sure the asparagus retains its green color yet with soft chewy texture. Transfer to a plate and set aside. In the same pan add a little more oil and saute mushrooms. Add 2T soy sauce, 2t sugar, 1/2T sesame oil, 1t sesame seeds, some pepper. Continue to saute until the sauce gets incorporated with mushrooms. 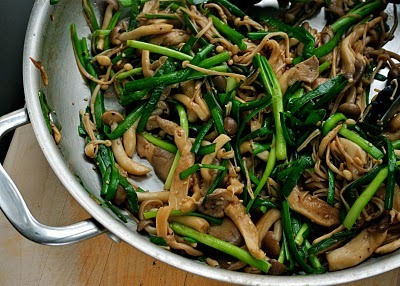 Add the chives to the mushrooms and stir-fry until they get wilted, about 1 minute. Transfer to a plate and set aside. Heat remaining oil in the same pan, add the glass noodles and stir for 30 seconds. 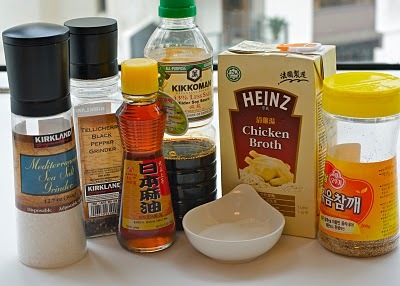 Add 2T soy sauce, 2t sugar, pepper, 1/2T sesame oil, 1t sesame seeds and let the noodles flavored with the seasoning. Remove the pan from heat and let noodles to cool down a little along with other ingredients. 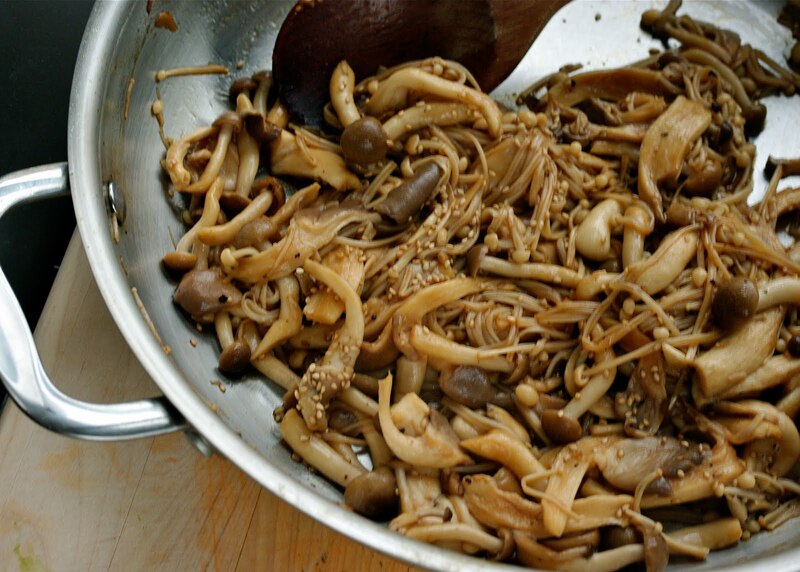 Return all the mushrooms and veges to the pan and toss with noodles. Taste first to see if you need more seasoning. You might need more soy sauce or sugar. Adjust seasoning as your liking. 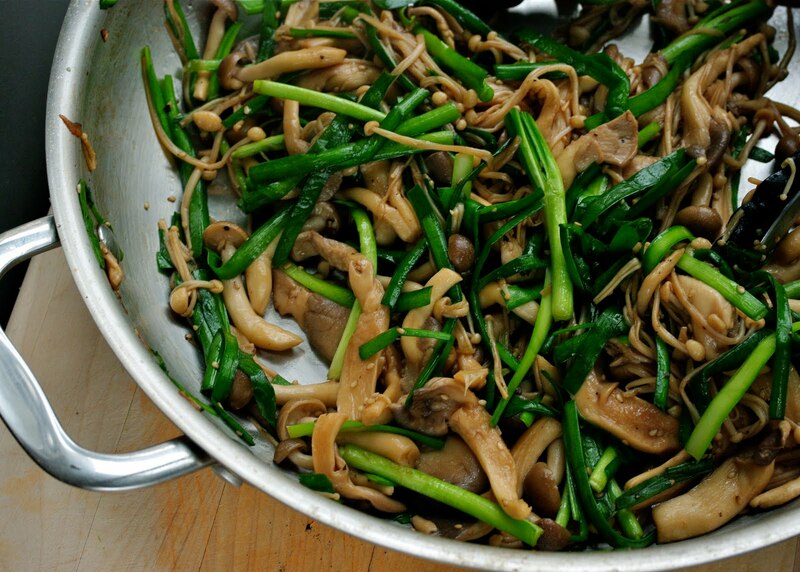 Serve warm or room temperature, with or without rice. 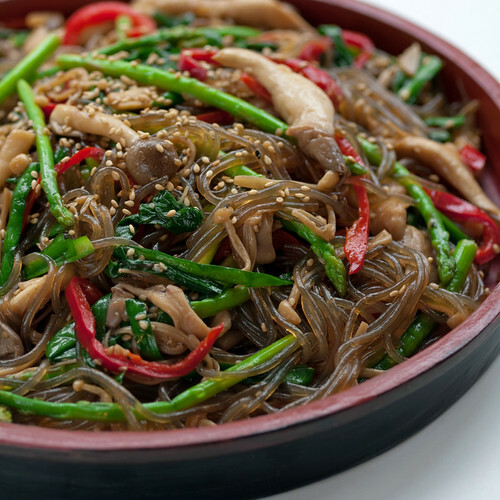 Yes, This Japchae is indeed healthy food. I am not sure if this can bring immortality but very delicious! Looks delicious! I also love the step-by-step instructions and beautiful pictures. I have regularly cooking this dish, the more traditional version, at home, but have not got a chance to organize it into a recipe and have it posted. Hopefully, I shall try this upgraded version soon : ). This japchae is beautiful. Such a great dish. I am so glad more and more people like to try Korean food. Hope you like the recipe. Nice step-by-step pictures. One of my favorite Korean dishes to order. Thanks for sharing. 자매님 최은경 자매입니다. 멋진 블로그이네요. 배울게 많아서 저도 많이 참고 하고 있어요. 너무 보고 싶었는데 카드를 받고나니 더욱 그립네요. 저도 딸이 생겼어요. 이제 두달 반이랍니다. 이름은 "이 로운" 너무 예뻐요. 말레시아로 내년에 가신다고요. 자매님을 만날 수 있는 기회가 있길 바랍니다. 자매님의 사랑과 모범이 자매님 빈자리를 채우고있어요.가족과 함께 건강과 행복이 가득하세요. I saw your recipe featured on Ree's website and I had to click over. This looks so fabulous and I can't wait to make it!! Thanks Jenna. Hope you can try some recipes and let me know how they turned out. Thanks Mary. I have to offer a big "thank you" to the pioneer woman for her link. Japcahe and Bibimbap is time consuming dish to make but worth the effort. You can feed a lot of people with single recipe. 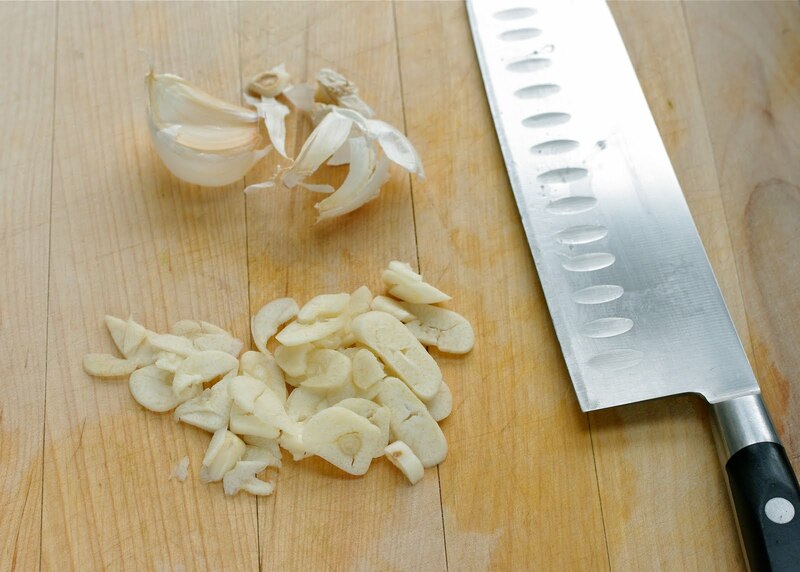 It is not difficult to make at all actually if you undestand the cooking steps. Hope you can try them soon. I also saw your recipe featured at Pioneer Woman and it looked sooo tasty. 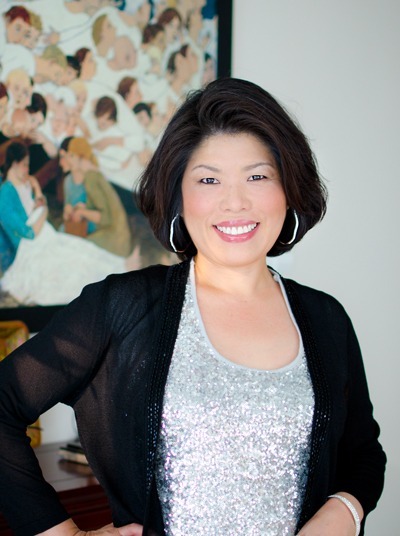 I have been in an asian food fetish lately and am excited to find your blog :) I am definitely going to try this!! Thanks. Hope you like it. Please let me know if you have any questions on the recipes. Have fun making them. Thanks for you comment. Japcahe takes time to make but it is well worth the effort. I made Japchae salad with Korean chilli vinaigrette a while ago and it turned out really good. It is much quicker to make than traditional method but tasted really awesome in a different way. My husbands favorite food is Japchae. I can't wait to try this! He hates pizza but will eat it if it has mushrooms on it so I'm pretty sure he's gonna love this. I KNOW I will! Thank you. 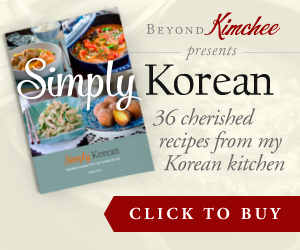 I made this for my monthly roving foodie group today (the theme was Korean) and it was a big hit! I wasn't sure if I was supposed to use green onions or regular onions in place of the Asian chives, so I thinly sliced regular onions and sautéed them with the bell pepper. I loved the mix of the three mushrooms. I used sweet potato noodles as suggested, but think I bought a thicker noodle by mistake and will get thinner next time. Also, I will try the chili instead of bell pepper (or a mix of the two) for extra flavor. Thanks for sharing the recipe! Thanks Marlene. I am happy to hear it came out great and everyone enjoyed. 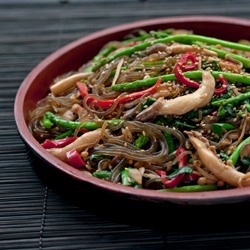 I love this japchae and it is a feel good food.